OAKVILLE, Ont. (Golf Canada) – Golf Canada is pleased to announce the 10 athletes—six female and four male—who have been selected to the 2019 Team Canada Young Pro Squad. Comprising the 2019 Women’s Young Pro Squad is Brittany Marchand (Orangeville, Ont.) , Anne-Catherine Tanguay (Quebec City), Maddie Szeryk (London, Ont.) Augusta James (Bath, Ont. ), Jennifer Ha (Calgary) and Jaclyn Lee (Calgary). Lee, 21, makes the transition from the Amateur Squad after turning professional in December. Ed. 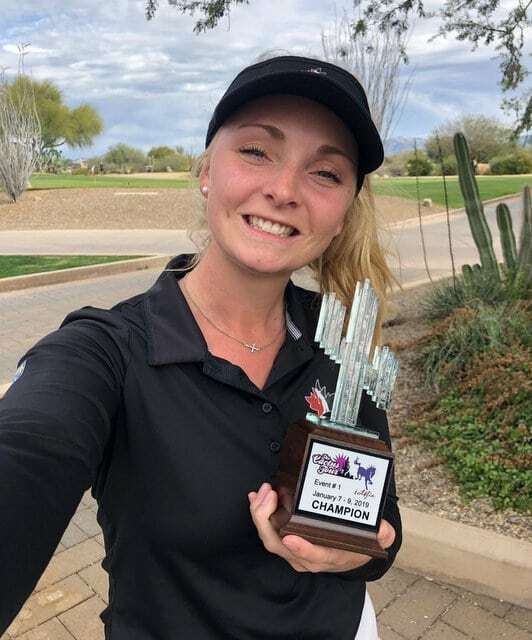 Note: A recent grad from the Texas A&M Aggies program, Szeryk won during her professional debut (following Symetra Tour Q-School) January 9 at the Cactus Tour’s Wildfire Golf Club tournament in Scottsdale, AZ. Read that story here. The Young Pro program is an extension of the Golf Canada’s National High Performance program which incorporates advanced coaching, sport science expertise, training camps and financial support. The intent of the comprehensive Team Canada high performance program – which includes an Amateur Squad, Junior Squad and the Young Pro Squad – is to aid Canada’s top up-and-coming athletes in all areas of their development, helping Canada produce the best golfers in the world. The Young Pro program is funded in large part by the Golf Canada Foundation with generous contributions from founding partners Canadian Pacific and RBC, as well as supporting partners Citi Canada, Bear Mountain Resort and the Golf Canada Foundation Women’s Fund. Additional support is provided by Own the Podium, Canadian Olympic Committee and Sport Canada. For more information visit www.golfcanada.ca/teamcanada. Golf Canada is the National Sports Federation and governing body for golf in Canada representing 319,000 golfers and 1,400 member clubs across the country. A proud member of the Canadian Olympic Committee, Golf Canada’s mission is to grow participation, excellence and passion in the sport while upholding the integrity and traditions of the game. By investing in the growth of the sport and introducing more participants of all ages to the game, our goal is to be relevant to and respected by all Canadian golf enthusiasts from coast to coast. For more information about what Golf Canada is doing to support golf in your community, visit www.golfcanada.ca.